McDermott worked at the Walt Disney Studios in the 1930s and later in the magazine field. He primarily depicted military, action, and horror subjects for men’s “slicks” like Argosy and True. He wrote four novels, one of them the basis for the movie Loving, in which his paintings appeared. He also produced three local war movies, including Gettysburg, which won a Ford Foundation grant. 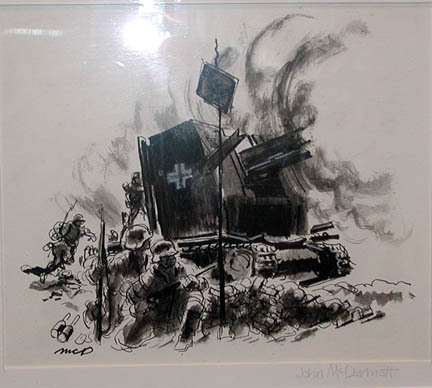 McDermott, John, “German Tank in Battle,” Westport Public Schools Digital Collections, accessed April 25, 2019, https://collections.westportps.org/items/show/560.